Blisters commonly occur when you use new and tight shoes or when you use sandals or high heels without socks. The risk of getting blisters also increase when your feet are warm and swollen, for example during training, walking or warm weather. When a blister occur the body often forms a blister pocket filled with fluid to protect the chafed area. What few people know is that the blister pocket helps the wound to heal faster. Avoid puncturing the blister as this increases the risk of infections and delays the healing. If you get a blister you should try to minimize friction and pressure on the injured area. Make sure to wear comfortable shoes that don’t rub on the blister. Use blister plasters to protect the blister and to accelerate the healing. The best way to avoid getting blisters from your new shoes, is to wear the shoes around the house a few days before you start using the shoes for prolonged times. This way you will soften up the shoes and discover exposed areas where the shoes are rubbing on your feet. Use socks when you break in new shoes to protect your skin from friction. Apply a cushioning blister plaster on the exposed area where your shoes rub or press on your feet. Blister plaster helps to protect the skin from friction, prevent blisters and relieve from pressure. The sooner you apply a blister plaster, the more effectively you can prevent blisters. If you are going to walk long distances, then it is important to use comfortable shoes and to change socks often to keep your feet dry and clean. Double socks can help to reduce friction between your shoes and feet. Use a thin, slick liner sock underneath and then a thicker sock on top. Make sure that the socks don’t wrinkle or make your shoes to tight. How should I treat a blister? Make sure that the skin is dry and clean from dirt, lotion and oil. Apply a blister plaster that covers the blister and attaches on the surrounding skin. Let the blister plaster stay on until it falls off. The blister plaster can stay on for several days, how long varies from person to person. When the plaster falls off, clean the blister and apply a new blister plaster. Repeat until the blister has healed. 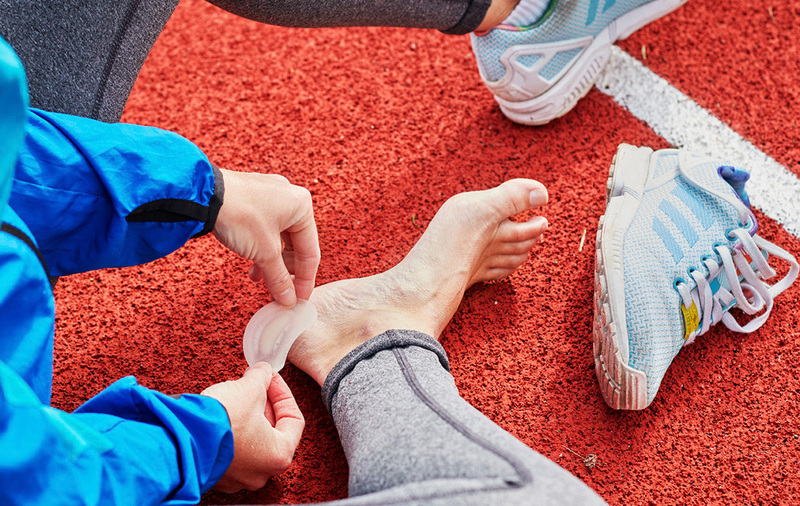 To remove a blister plaster: stretch it out slowly in the direction of the skin (do not pull upwards).